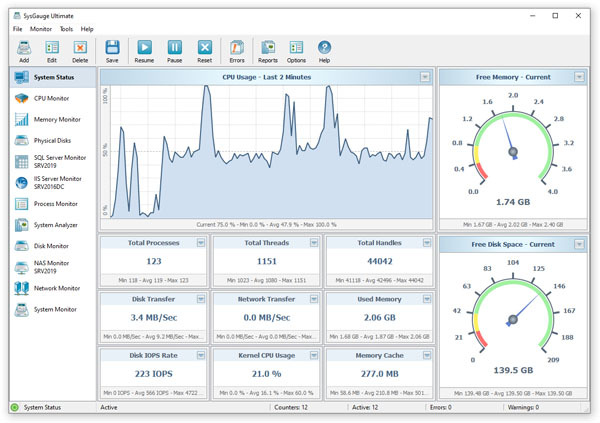 The SysGauge GUI application provides a single, customizable GUI module and a number of dedicated GUI modules especially designed for each specific monitoring task such as system status monitoring, CPU monitoring, memory monitoring, process monitoring, system status analysis, disk monitoring, NAS server monitoring and network monitoring. The monitor selector, which is located on the left-side of the SysGauge GUI application, allows one to add, edit and delete specific monitoring GUI modules. The SysGauge system monitoring utility provides a large number of different types of performance monitoring, system resource monitoring and operating system status monitoring counters and allows one to select which counters to monitor. In addition, users are provided with the ability to specify how to display the performance monitoring results for how long to keep the results history. 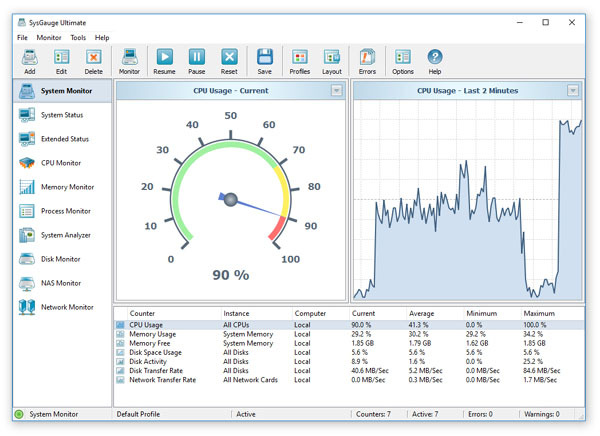 In addition to the ability to monitor the local computer, SysGauge allows one to connect to remote computers and monitor the CPU usage, memory usage, network transfer rate, disk space usage and disk activities via the network. The user is provided with the ability to specify the name or an IP address of the remote computer to connect to, select which types of system counters to monitor and specify how to display the system monitoring results. 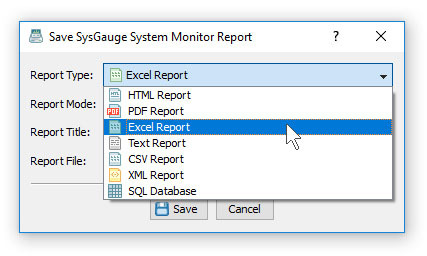 One of the most useful capabilities of the SysGauge performance monitoring utility is the ability to save performance monitoring reports into a number of standard formats including HTML, PDF, Excel, text, CSV and XML. In order to save a performance monitoring report, press the 'Save' button located on the main toolbar, select an appropriate report format, enter a report file name and press the 'Save' button. 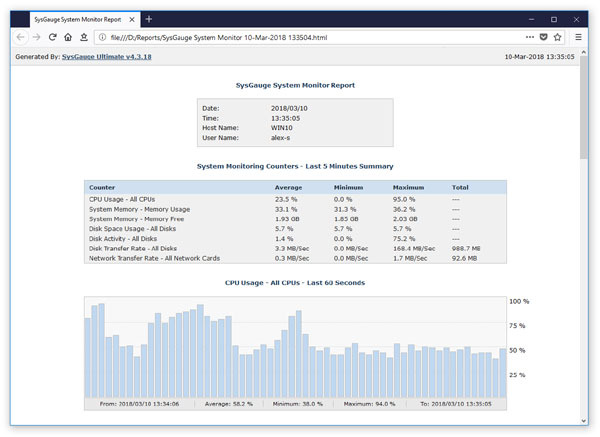 For example, a SysGauge PDF performance monitoring report starts with a summary table showing the report date and time, the name of the monitored computer and the name of user saved the performance monitoring report. The summary table is followed by a list of performance counters showing the average, minimum and maximum values for all performance monitoring counters. The list of counters is followed by a list of line charts showing performance monitoring data for all counters. Finally, the list of line charts is followed by a list of tables showing the complete history of monitoring results for all counters. 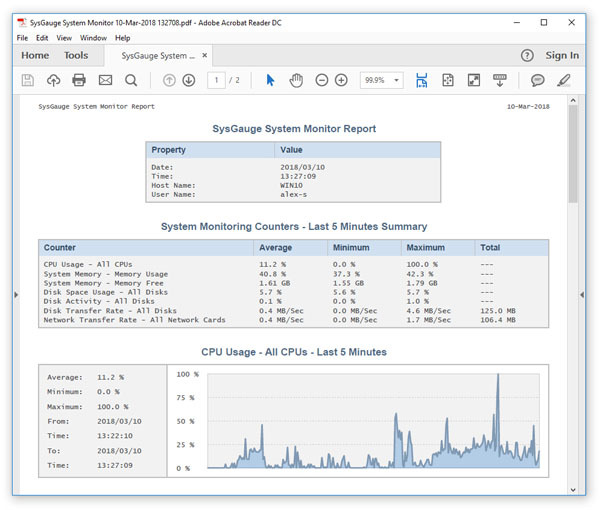 In addition to the GUI application, SysGauge Ultimate includes a command line utility allowing one to perform different types of system monitoring operations from batch files and shell scripts. 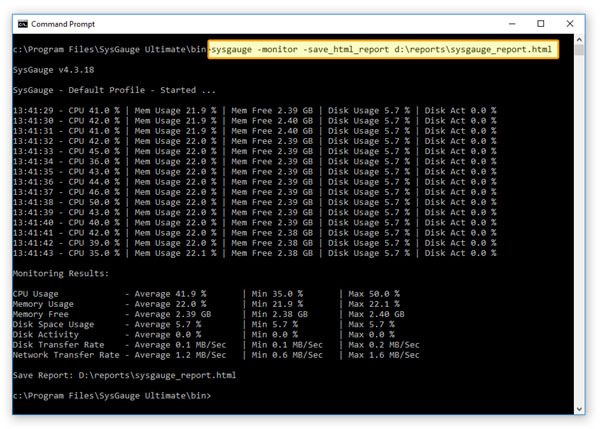 The SysGauge command line utility is located in the product 'bin' directory and it can be used to perform monitoring operations, save system monitoring reports and manage system monitoring profiles. The SysGauge command line utility will start the default system monitoring profile and continue the monitoring operation according to the user-specified period of time specified using the '-time <Seconds>' command line option or until the ECS keyboard key is pressed. using the '-host <Host Name>' command line option.